As Noddy Holder reminds us every single year hundreds of times – It’s Christmas! Time to get your cash out and buy your loved (and not so loved) ones some special goodies. Midget demotivational poster. Christmas Shopping caption photo. But don’t get it wrong otherwise you waste your money and the receiver of the gift thinks your a plank. Unless they specifically ask for funny socks with boobies on then don’t bother getting socks. Unless they like being the office idiot a musical tie is not wise. And you know it, even when you’re at the checkout. So what do you buy? If buying for a middle-aged man some vouchers for American Golf should do it, or Joop aftershave. For a middle-aged woman vouchers to get her nails done. For boys you need toys, and girls you need fluffy stuff. For golden oldies a nice wine rack or classical CD should be a winner. Failing all of that a wedge of cash, you know they will love it. In the words of Gordon Ramsay – DONE. Merry Christmas to everyone, enjoy your mince pies, and remember the picture above, don’t forget the little ones! 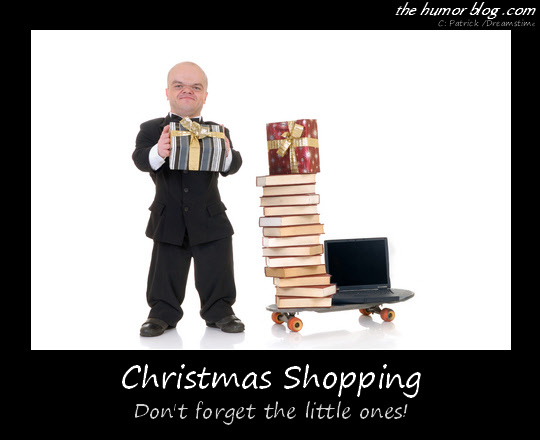 Funny caption image created by thehumorblog.com, midget dwarf photograph copyright Dreamstime © Patrick. aww!! lol that was soo cute. gift cards to get the nails done? she definitely doesn’t have to be middle age for that.. plus that’s more like a birthday gift. It’s Christmas, how about a gift card for an entire day at the spa!